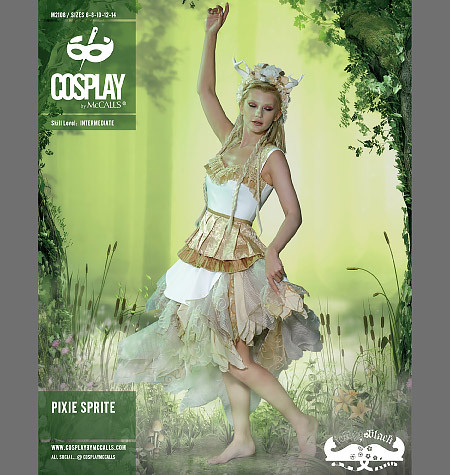 Cosplay by McCalls has released another lovely set of patterns that will work in your regular wardrobe as well as your costuming projects. Romantique M2109 (XS-XL), is a lovely bed jacket with elbow-length sleeves. It also has a nice set of Victorian corset covers included in the pattern. You’d never know this by the cover pic, which at a glance looks just like a sweet little capelet. The skill level is easy, but it does not have that “easy pattern” look. No boring boxy shapes here. There are a lot of ways to go with Romantique’s bed jacket. As a dramatic person, my first change would be to make it floor length. Just extend pieces 6 and 7 and voila! What a way to make a grand sweeping entrance—and I’d do it in velvet. Might have to piece it, but it would be worth it. Pair it as shown with one of the camisoles and Prelude M2082, Hitched M2072 or Wayfaress M2085 for a complete look. The camisoles (corset covers) have a Victorian feel. There is both a cropped and waist-length version. The cropped is adorable, and really should find its way into your regular wardrobe. Layer a cardigan or hoodie over it and wear it with jeans. Charm School M2112 (6-22) is a killer jacket, suspender skirt, and neck tie set. 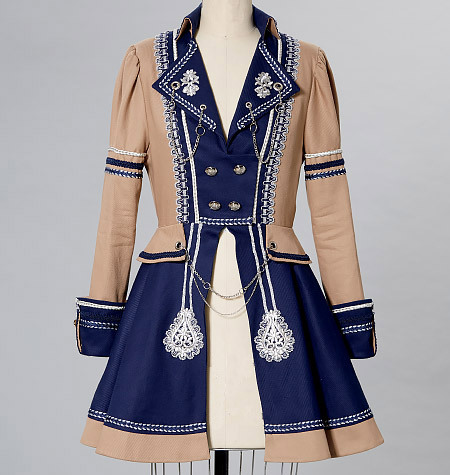 The jacket is very detailed, with a peplum and nearly a full-circle skirt attached. It does not look like a circle here, but there is a full half-circle in the back. The suspender skirt is a full and pleated A-line. The blouse is not included. I love the jacket. I know it looks like the armhole is way low, but I checked the pattern pieces and it looks okay for an outerwear armhole. Likewise the photo seems to show the sleeve cap being short. I am not seeing that in the actual pattern pieces, so both of these problems seem to be an artifact of the sample garment. You may still wish to check those for yourself. Make it up in Donegal or Harris tweed, melton, or velveteen for a truly rich look. Ichigo Black is back again with a sweet dress with fitted bodice: Pixie Sprite M2108 (6-22). It says it’s an intermediate skill level, but I am not really seeing that. The designation might be due to the “place it wherever it looks good” nature of the skirt squares. The ruffle look in the skirt is achieved by folding squares of fabric like large hankies, and tacking them all over the skirt of the dress which, happily, is a circle. You can just lay the whole thing flat on the floor and pin everything in place as you like it. Easy. The look of the dress will vary wildly with the fabrics you use for the handkerchief squares. Tulle, chiffon, lace, taffeta, gauze, organza, gazar, voile, even calico would all work. Do this in Christmas or Halloween prints for a great take on holiday party clothes. Cut up old table cloths, or use up all the scraps from all of your other projects as a sort of walking “photo album” of your work.